M.C. Escher is the Dutch artist widely credited with popularizing the tessellating form. Students should definitely view the work of Escher as a part of any math unit on tessellations. This review may include discussion of transformational geometry as students identify whether the tessellating pieces translate (slide), rotate (turn), or reflect (flip) to create each tessellation. Students may begin their investigation using pattern blocks to identify which of the regular shapes will tessellate the plane. 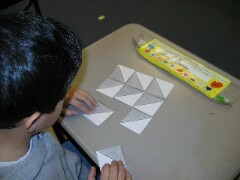 Depending on the age of students, they may combine shapes to find combinations that will tessellate the plane. Finally, students should be encouraged to develop their own original tessellations in the Escher style. Doing so will definitely increase their admiration for Escher and the many contemporary artists who work in this field. The shapes are rather easy to create. The inspiration to see the character hidden within is a greater challenge for beginners. While the true artists most likely begin with the end in mind, beginners usually create a piece then try to figure out what they have created. This process guarantees a lot of fun and many laughs as students rotate and flip their shapes to figure out just what they could be. 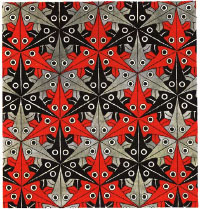 Be sure to include the Develop Escher Eyes activity before students attempt their own original tessellations, using the directions also found in this collection. View the new Mathwire Tessellations collection to view suggestions for introducting the topic and to download Develop Escher Eyes and the directions for creating Escher-style tessellations. Challenge your students to develop spatial sense with this fun mathematical quilting activity. Students use simple squares that are divided on the diagonal, half black and half white. They must assemble the 4 or 9 squares correctly to produce the desired pattern. This activity helps students develop a working knowledge of slides and turns as they attempt to reproduce the larger pattern square by square. Students naturally like to create their own patterns to challenge classmates, so teachers may develop additional patterns to add to their repertoire. Add this activity to your ongoing math center. Read more about the Quilt Square Challenge for a lesson plan, classroom management suggestions and to download all of the materials needed for this class lesson.